Refridgermiration: Fears Vs Dreams . But I had fun , and that's what counts right ? Last night , I went shopping . Online at TWLOHA . 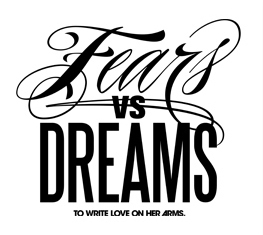 Fears Vs Dreams Logo From TWLOHA . And one of the things that stood out to me , on their actual website ( twloha ) was the Fears Vs Dreams tab . I clicked it , and it took me here : http://fearsvsdreams.com/ . It made me wonder , what are my fears and dreams ? If I was asked that question , I actually would have to think about it . So I've been thinking about it all day . Fears : Rejection . Failure . To End Up Alone . Letting Other Peoples Opinions Of Me Bring Me Down . Dreams : To Live Overseas And Help Others As Much As Possible . To Become A Nanny . To Be Accepted For Who I Am .To Save A Life . To Find Someone Whom I love And Who Loves Me Unconditionally . What are your fears and dreams ?